As a Pinot Noir fan, I was delighted to discover this recent creation in Upper Hemel en Aarde (Creation winery pictured above). 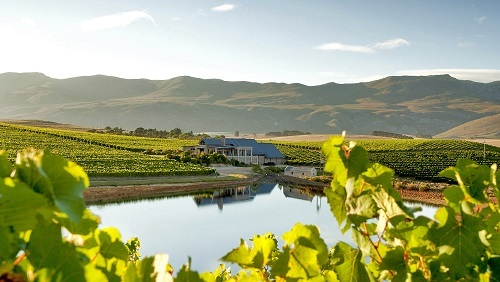 Set up by Swiss-born winemaker Jean Claude Martin and South African-born Carolyn Finlayson on the scenic ridge at 350 metres altitude. It was barren land when they arrived in 2002, but as their 11 vine varieties have matured, Pinot Noir and Chardonnay have shown most potential and both benefit from a couple of years cellaring if you buy them young: Pinot Noir Reserve 2014 (£29 www.shop.creationwines.co.uk; www.slurp.co.uk). I discovered the small Carpinus winery on Lidl’s shelves. Carpinus Harslevelu 2017 (£7.99 Lidl) is the best bargain dry white from Tokay with citric, sweet sour, sappy minerally style and just 11% alcohol made from rare Harslevelu. Sister and brother Edit and Istvan Bai worked at Dr Loosen in Germany and Alta Vista in Argentina and Pajzos in Hungary, now they tend their family’s classed growth Tokay vineyards like famed Gyertyanos; they also make dry Furmint and sweet Aszu. 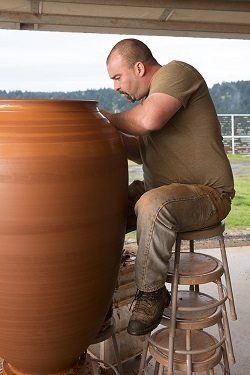 Andrew Beckham (pictured right) is both talented potter and winemaker, inspired by Elizabetta Foradori in Italy, he returned home to Chehalem Mountain slopes keen to replicate her natural winemaking style. He sources clay from Sacramento Delta and makes different amphora sizes for maturing wines (his largest is 200 gallons). AD Beckham Amphora Pinot Noir 2014 (£41 Les Caves de Pyrene) is earthy dusty brick-textured Oregon Pinot Noir made using 35% whole clusters fermented in amphorae, then aged in 12 year old oak. As daughter of famous Mr Baga (Luis Pato), the man who has put Bairrada on the wine map, you might say Filipa had a head start in the wine world. Yet she decided to carve her own furrow. 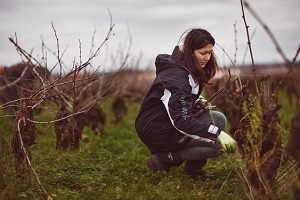 She trained as a chemist, worked in Bordeaux, Mendoza, Margaret River and on returning home, instead of joining her father, she rented vineyards in Bairrada and Dao focusing on biodynamic methods and makes wine with her Belgian husband William Wouters. 3B Rose Extra Bruto (£14.50 The Wine Society) is delightful dry fizzy blend of Baga and Bical. Juan Pablo Michelini runs a dynamic boutique winery in Gualtallary in the beautiful Uco valley in Tupungato over 1,300 feet in the Andes foothills. Founded in 2007, they developed into ardent experimenters fermenting wines in unlined concrete eggs (one of the first in South America to use them) which they feel add freshness, weight and texture. Their egg-fermented unoaked Eggo Malbec Tinto de Tiza 2016 (£16 Marks & Spencer; Slurp) has bright pure sappy damson fruits and soft silky palate texture. Winemaker Zurab Topuridze made his first natural wine when just 13. He now runs his small family winery with vineyards in Guria and Kakheti in Georgia. The winery was named by his children, refering to the ancient people of Caucasus, the inventors of winemaking 7000 years ago. It also looks like they designed his wine labels. 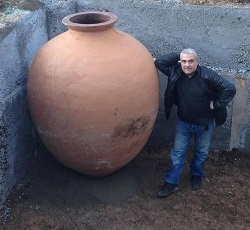 His delicious Saperavi 2017 (£21 Les Caves; Exel Wines) made in underground Qvevri (amphora) is the most approachable Georgian red available. Herbert Zillinger is based on the Austria/Czech border in Ebenthal village with a 7 hectare family estate he took over at just 20 in 1998; he has since converted to organic and biodynamic. In this beautiful corner of Austria, Zillinger makes wonderful Gruner Veltliner and cherry fruited spicy Zweigelt (£20 www.therealwineco.co.uk) the most popular red at our Austrian tasting. He also makes delicious sparkling Indiskret Zweigelt. Little known growers Nicolo & Paradis are based in southerly Cote des Bar, home to the region’s best Pinot Noir. 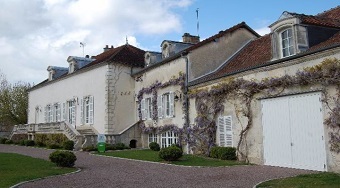 Run by a young couple David & Agnes Nicolo who live in a beautiful C18 manor house, once owned by General Vouillemont of Napoleon’s army. From their 17 hectare vineyard they make distinctive affordable Champagnes: their best is three years lees-aged Cuvee Manoir Vintage 2010 (£40 Amathus Drinks). Impressive San Marzano co-operative in Manduria in Puglia’s Salento peninsula was formed in 1962 by 19 growers whose families farmed land in Puglia for generations. I have shown their oaked Chardonnay/Moscatelle\Fiano Edda Lei Bianco 2017 (£15 Strictly Wine) and flagship red from 80 year old vines Primitivo Riserva 62 Anniversario 2015 (£20-£24 Strictly Wine; Luvians) at many tastings and they always emerge as tasters’ favourite bottles. If you want to taste the best Kiwi Cabernet Sauvignon blends head to this single vineyard estate winery on beautiful Waiheke island near Auckland run by expat Americans Michael and Ann Spratt with son Sean as winemaker. Prices are heading up, but quality is superb: Destiny Bay Destinae 2012 (£50 Whitmore & White). 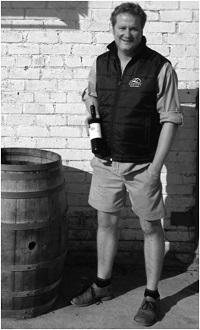 Edinburgh-born Andy Smith began his career shifting cases for Oddbins and Raeburn Wines. 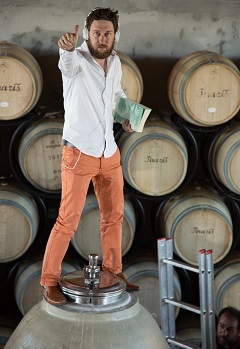 He studied winemaking in New Zealand, before heading to California in 1990’s to find his fortune. 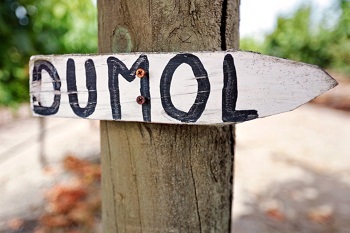 As viticulturalist and winemaker at DuMOL in Russian River his style has evolved from richer wines to subtler lighter styles. His range is superb, I particularly enjoyed DuMOL Pinot Noir 2009 (£50 Raeburn Wines) from his Coffee Lane vineyard. Hidden away in a remote packing shed at Farnsmanskraal (once used by Neil Ellis) on Devon Valley hill, Lukas van Loggerenberg is making a name for himself. After working in Tulbagh, Paarl and the Finger Lakes region in USA, Lukas went solo in 2016. He buys in grapes from growers and in two vintages has shown huge potential. His oaked Chenin Blanc (Trust Your Gut 2017 £28 The Wine Society) is gloriously intense and elegant.